I’m continuing this little mini-series with some of the results from a recent survey of my top VC-using teachers. Read more about it in the first post of this series. Remember, they are using videoconferencing to support curriculum instruction (not full length courses). If your principal or superintendent walked into your classroom during a videoconference, give five adjectives to describe what they would see happening. Now isn’t this a nice set of words! Notice the motivation adjectives: excited, smiles, amazed, happy, laughter, interesting, interested. Notice the learning adjectives: learning, engaged reflective, involvement/involved, attentive, cooperative, active, interactive/interacting, communication, higher-level, knowledge, perform, reinforcement. I did take out the word students – as many teachers wrote “students” after each adjective – and so it was huge again like the first wordle I did in this series. But I wanted you to see the adjectives larger and clearer. See if you can find the one word that isn’t so positive. 🙂 Yes, I’ve seen a few kids do this in a VC. Have you? 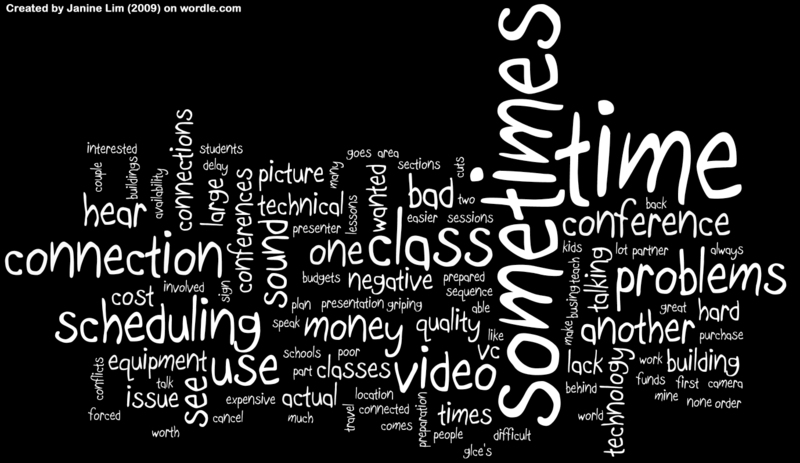 Are these good reasons to use videoconferencing in your curriculum? Why or why not? Please comment. What kind of videoconference professional development opportunities are you giving to the teachers and schools you support this year? I just got my forms and options listed online for my schools, so thought I’d share what I’m up to. We’re in the third year of our RUS grant implementation, and some schools are still working on meeting these requirements. Each coordinator has to take two “long” classes through the course of the three years of the grant. They are graduate credit length classes. There are several options for them to meet this requirement. At least four teachers (other than the coordinator) need to do some type of professional development about videoconferencing. This can be either the long or short courses, depending on the PD needs of the teachers in the school. Each school building needs to participate (with at least two teachers in attendance) in at least one after school workshop about a topic other than videoconferencing. I’m really pleased with how some of our content area consultants have already planned their VC workshops without any reminding from me! There are a couple more that I’m hoping will offer something this year, but we have nice line-up already. One new plan for this year is the Content Provider Showcases. Last year I didn’t do any content provider showcases and several of my schools were begging for them. They really want to be able to attend them at their school right after school. So I’m trying a new format. Multipoint. I explained it to the content providers and as long as they know I’m bridging and will be moderating to keep the multipoint connection in order, they are ok with it. Program, not overview. I’m also paying the content provider for a full program, so that instead of just a talking head about the programs they offer, we’ll actually experience what it’s like to participate in a program. Prize drawing. Finally, I’m going to pay for three programs; so after we are done with the provider, we’ll do a drawing and give three programs away to the teachers who attended. I’m really hoping this new format will generate interest and will remind teachers to pick their videoconferences for the year soon. Finally, just a reminder that I’m still offering two online classes for integrating videoconferencing in the curriculum. These classes are open to schools outside of our area (indeed, most of my participants are not in our area). I’m willing to negotiate bulk discounts if you have several teachers who want to participate. Or if you’re rolling out a new implementation and would like coordinators in all your new schools trained, we can negotiate a price for a session just for your area. Let me know if you want to discuss further. So, what are you doing for PD for your schools/teachers this year? This week I’ve been facilitating three Point-to-Point MysteryQuests for Reed Middle School in Bridgman, MI. They connected to MO, NJ, and CA. It’s our first time running MysteryQuests in just an hour with just one other school. The time frame better fits the traditional middle school schedule and makes it easier for the teachers to schedule and participate. We did one each day so that they weren’t scheduled back to back. 10 min. Sharing guesses, correct answers, and some time to ask each other questions. The teacher and I discussed the computers issue and decided to not allow computers during the first research portion. The hard thing about a decision like this is the varied difficulty level presented by the other classes. One of the class presentations was so hard that we didn’t get it at all. The other one we were able to get even after losing 20 minutes to technical difficulties. It seems to be an issue to play by ear. In the session with the hard presentation, we allowed the students to use computers sooner. If you’re familiar with the MysteryQuest format, you’ll notice that one difference here is the amount of research time. In a traditional multipoint MysteryQuest format, students have 30-40 minutes to research. Of course in that format they are research 4-5 other presentations. In this case, the whole class is researching the one presentation. In theory it should go faster. But we did find this week that each time when the 20 minutes were up the classes wanted more time. The classes seemed to be mostly involved as usual. I did notice some “behavior” in front of the camera towards the end of the research times. With just one presentation to research, it’s harder to get all the students involved in the research. Easier to lose some who are prone to get distracted anyways. However, it seems to me that the lack of scheduling headaches seems to outweigh this disadvantage to the shortened format. In the connections where we didn’t have technical difficulties, we were able to spend more time letting the students ask each other questions. My sense is also that if a teacher does this a couple times, they’d be able to do a point to point MysteryQuest without a facilitator. I would like to get to that point so that we can increase the number of these sessions. There’s only so many sessions a person can facilitate! I look forward to additional feedback from my teacher. We’re doing another point-to-point one in March with a different teacher, so we’ll see how that one goes too. Overall though, I’m pleased with this adaptation of the program to make it easier for our middle school classes to participate. I’m running the Planning Interactive Curriculum Connections class again. Here’s a comment you’ll enjoy. This from Karen Ennesser, Dowagiac Middle School, who participated in Eco-Conversations in December. Dowagiac Middle School is one of our RUS grant buildings too. I personally feel that every school should use VC. The benefits to my special education and Title 1 students were absolutely amazing! They played a big part in drawing the backgrounds…and felt very successful! These students were on equal ground with the “A Students” and did a better job!! It had an educational impact on EVERY student that I teach! I hear this often – the impact that VC (and even just technology in general) has on special ed students. We need to keep collecting these stories and comments on the impact that curriculum videoconferencing has on our students. I used to do all the scheduling for our schools, but they are using it so much we can’t keep up anymore. When we missed out on NASA programs two times for middle schools last year because we were so slow to process our scheduling pile, I knew something had to change. The scheduling workshop covered which programs should be scheduled through us (ISDN, mini-grants, and programs we offer) and all the details of how the whole process happens. Using our district VC calendars (hosted in a Filemaker Pro database), the coordinators can see the status of all requested programs. Then we talked about how to schedule with content providers. My schools do their own scheduling with providers when the program is free, or when they are paying for it themselves (which is almost never!). So we walked through how to use NASA’s scheduling system with the online calendar. We also looked at how the Cleveland Zoo’s online scheduling system works with the specific dates and special registration link for each program. We also discussed how to schedule with a content provider that prefers email or phone contact. Including all the necessary details – teacher contact info, grade level, number of students, tech contact info, tech details, billing information, all the times & dates you can do – in one email makes it a lot quicker to schedule. Finally, we discussed scheduling projects with other schools. A few of my videoconference coordinators are now capable of finding their own partners for projects. We talked about the various ways to find partners. Also most of my districts still have just one or two T1s coming to us and then out to the Internet, so they can only do one videoconference at a time. We use the district VC calendars to make sure we don’t schedule a program on top of another one. The next session in the series was a mini-jazz session. I’ve blogged about these trainings before. Basically they consist of a quick intro activity that gets everyone on camera presenting, an overview of appropriate curriculum videoconferences for that grade/subject, and some brainstorming of projects. Then the work of making them happen afterwards! This September I offered a K-2 session, middle school science and middle school social studies. The Eco-Conversations we did this month were a result of the middle school science session. The next session was an overview of the new equipment that was delivered in September to the RUS grant buildings. They received an Avermedia QuickPlay for hooking up laptops, a Lumens Digital Visualizer document camera, and a DVD/VCR combo. We hooked everything up, practiced with all the buttons, showed best (and not-so-best) practice. Everyone also shared how they had seen others use document cameras in a videoconferencing, any scenarios they had last year when they wished they had a document camera, and any ideas they had for using it this year. In the troubleshooting session, we started with everyone sharing horror stories. What’s the worst thing that’s gone wrong in a videoconference? Then we walked through a HELP Troubleshooting handout that I made this fall. We tried to “break” and experience as many of the problems as we could and then fix them again. We also talked about the “yellow button” on the Polycom remote that tells the stats of the call and discussed what it means to have packet loss. We practiced changing the speed of the call and dialing at different speeds. And we discussed how to deal with echos, what causes them, and some possible solutions to share with your partner school. Most of the earlier sessions were in September and October. Then the first week in December, we finished the series with a sharing session. Scheduling. Everyone shared what they had scheduled and how it went. We learned that persistence is a key skill for scheduling! Scheduling. We talked about Read Around the Planet and how to prepare for registration. Mini-jazz. We shared the status of ideas, and experiences from the sessions that happened. Document cameras. Everyone shared how they used it. Some shared examples as well. Jane Markle, Sylvester Elementary coordinator, shared how she used the document camera’s freeze and capture options to capture the pictures from a book to read to the students in the library. Daniel Daniel, art teacher at Coloma Jr. High, shared some student artwork. Troubleshooting. Everyone shared how they used their new troubleshooting skills. Content providers. Everyone shared content providers they connected to this fall (or past spring), and what they liked about the program. Projects. We closed with sharing collaborative projects that occurred this fall or are planned for the winter/spring. Much discussion around Monster Match, which was a huge success in October. I shared this here so I have a record of it later! And also because it might be helpful to you as you plan training for your teachers and videoconference coordinators! The presentation from Westcliff High School for Girls included a play on “The Weakest Link”. Five students were interviewed about how they got to school. After their carbon footprints were revealed, the student with the highest carbon footprint was pronounced “the weakest link. Goodbye!” Their students also interviewed our students as part of a school energy use survey. The Simon Langton Grammar School for Boys is one of the only schools in their area to receive a “green flag” status for schools in their area. We learned a lot about what they are doing for the environment in their school and community. This connection we had trouble with the audio. At the end, they couldn’t hear us, but we could hear them. Some students ran quickly to get a whiteboard and they improvised. It still worked out very well. Even in the Q&A section, students were focused on the environment issues. They asked questions such as, Do you have ethanol for your cars? How far do you drive to school? Do you have all big cars in America or is that just a British myth? Next we connected to Rosslyn Jr. High, in Edmonton Alberta. Students asked questions like, What is your local government doing to reduce carbon emissions? And, what is the cost of gas in your area? St. Peters Church of England School. This group is working on putting a recycling plan in place in the school. As it happens, they have a group called the Global Action Plan coming to their school for a waste audit the day of the conference. Their presentation included the work they are doing on waste products and also about the waste audit. There are about 10 students in the EcoGroup school club. When talking to the coordinators and technicians, we learned that there are over 200 schools in the UK who want to do projects like this. I think there is a big untapped market for collaborative projects in the UK. We just need to figure out how to find each other. I believe that sites like Collaborations Around the Planet, Global Leap, and Janet Collaborate are important tools for finding collaborative partners in the UK. The trick is, if at all possible, figure out the time zone difference for your desired connection ahead of time so you can ask for reasonable timed connections of your potential partners. When we emailed for partners, I listed both times, EST & UK. My students absolutely LOVED IT. You know they really liked it when they are telling other teachers and students about it!!! Talking to another country is by far the best VC out there!! When you have students like those here in Dowagiac who have maybe been as far away as Detroit or Chicago (many not that far) they are fascinated with the accents, language usage…….very cool, I would talk to another country any time it was available! Finally, thanks to Google Alerts, I ran across this great write-up from the Dowagiac Daily News. A great experience for one of our RUS grant schools, showing the power of videoconferencing in rural schools. Yesterday an AverMedia QuickPlay came in the mail from Troxell Communications. We ordered one to see if it would work for our RUS Grant building carts. This will allow the teachers to hook up a computer to share their presentations for the project VCs with other classes. I’m really pleased with the little unit. It’s so easy. I tested a Mac and a PC and they worked great connecting S-Video into the document camera input on our Polycom VSX 7000s. So, I’m sticking with the tried & true scan converter method of hooking up a computer. Of course the easiest method is to zoom the camera in on a laptop screen. No wires! 🙂 Call me old-fashioned, but hey, it works consistently with whoever you connect to! Last week I posted our final report online and have been mulling over the implications since. Largely due to the RUS grant, our districts averaged a 400% increase in usage this year. We almost doubled our total usage across the whole service area for the second year in a row. This year 63% of our programs were free; the majority of those project or classroom-to-classroom connections. However, while those numbers sound good, this year we looked at another number for the first time – percentage of teacher use. I have a couple elementary buildings where 100% of the teachers participated in at least one videoconference with their students; however the average across our two county service area is about 23%. This raises some questions in my mind. Is it our goal to have every teacher use videoconferencing? Should it be? Some of my new RUS grant building coordinators want every teacher to use it. They are all in elementary buildings. Middle and high school classes still prefer high end challenging content which is usually rare from content providers and it’s still impossible to pay for every class to participate in a program. I don’t see that changing anytime soon. Is it possible to integrate enrichment videoconferencing across the board at the middle & high school level? Middle and high school classes also don’t see the value of classroom-to-classroom connections as much as elementary teachers do. They want a higher curriculum bang for their buck (or time), and connecting to another school doesn’t always provide that. Is there a way to create curriculum-rich, challenging, free projects for middle and high school classes? In addition, what seems to be high use from my perspective is only 23% of teachers in my service area. If 23% usage is driving me crazy and I can’t keep up; something has to change to make additional growth sustainable. At what point will my building coordinators also feel that it’s driving them crazy and they don’t want to support anymore connections? The work load of supporting videoconferencing (curriculum wise) is shared between the teachers, the building coordinators, and support from the ISD (me). How can we support this in a way that is sustainable and makes room for additional growth? I’m hearing from many of my RUS grant buildings that they are basically pleased with the results of the first year and hope to get more teachers involved next year. How do we sustain that growth & prepare for it? Raising the district contribution to our mini-grants from $25 to $50 to spread the funds further. Switching from supporting and making every connection to supporting only those that we’re running (i.e. MysteryQuest & ASK) and ones that the buildings have trouble connecting on their own. This is a huge shift for me and one that I wasn’t ready mentally for last September. But as my schedule filled up, I had to move to this model. Now we’re making it official policy. Are YOU ready for this change if you’re at an educational service agency? It’s coming your way too! More professional development, specifically that which helps building coordinators schedule & troubleshoot on their own and helps teachers design projects & match up with partners. Help my buildings become more independent. This is not only happening at my level; but at the district tech coordinator level as well. In several districts where the district tech coordinator used to help with every videoconference, they are now leaving it to the building coordinators and assisting only when there are problems. Often more content & dream up more projects, especially for middle & high school classes. My challenge here is that I really can’t add more projects that I have to coordinate and facilitate the videoconference. The projects need to be point to point and the teachers need to be able to do it themselves (like Read Around the Planet). This means good high quality teacher packets for projects that tightly match the curriculum. So how are you addressing and sustaining growth in your area? Do you see these same challenges? Do you think every teacher should use videoconferencing? Please comment!